Home 2018 Alex Rins Andrea Iannone Valentino Rossi Valentino Rossi Prediction Coming MotoGP 2018, Beware Honda, Ducati, And Suzuki! Valentino Rossi Prediction Coming MotoGP 2018, Beware Honda, Ducati, And Suzuki! My position is not extraordinary, but I should be a tenth faster because I'm actually not 'all out' to do attacks on the side of time. Valentino Rossi ended the 2018 MotoGP Qatar 2018 second day test in 11th place with a time difference of 0.730 seconds compared to Suzuki Ecstar racer Andrea Iannone as the fastest rider tested at Losail International Circuit per Friday 2 March 2018. The surprise of Iannone on the second day makes Rossi to compare with the performance shown by the three manufacturers namely Honda, Ducati, and Suzuki ahead of the 2018 MotoGP opening. Meanwhile, Yamaha assessed to be still at the same level as the end of last year. "It looks like Ducati and Honda, also Suzuki is now tough, so we need to work," said Rossi after the second day of testing session on Friday (2/3/2018), as reported by GP One. "It's hard to predict (the course of the 2018 MotoGP season), but especially in the second half of 2017, Ducati and Honda both advanced with great strides while we battled. We're still more here, so we have to work hard, "he added. The Doctor succeeded in ending the MotoGP pre-season test of Qatar the first day in sixth, with a record time equivalent to other Suzuki Ecstar racers, Alex Rins. But on the second day, Rossi just managed to end in the 11th position. "My position is not extraordinary, but I should be a tenth faster because I'm actually not 'all out' to do attacks on the side of time. I put a new tire at the end, but feel some vibration in front and so can not increase, "he explained. 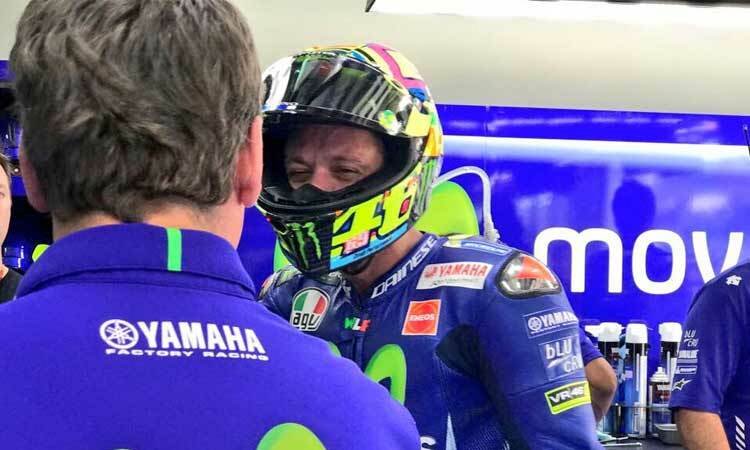 Difficulties in the front tires became one of the fears of Rossi at the Losail circuit, which will be the first circuit that must be faced by the MotoGP riders in the opening of the new season. "My speed is not bad, the problem is the front tire because when we use something like this, medium compound, it's hard to even to finish half the race. We have to improve this because the hard drive tires are not good for us, maybe if we work on motor balance, "he explained. As mentioned earlier, the owner of the VR46 racing number also highlights the electronic side of the M1 racing motor. "I think we are more or less at the same level as last year. I like the new frame, the motor turns better, but I think we need to work on the electronic side because we suffer in acceleration. It is difficult to get out of the turn, especially with the tires that have been used. Our competitors are tougher in this aspect, "he said. Before facing an official test in Qatar, the MotoGP riders have completed two pre-season test sessions held since early 2018 at Sepang and Buriram. According to Rossi, the sensation he gets in tests in Qatar is currently among what he experienced in Sepang and Buriram. "Among those in Thailand and those in Malaysia. Sepang is the best test we did and then in Buriram we battled. Here, we are in between, "said Rossi. Furthermore, the drivers will take the official Qatar MotoGP test the third day, or the last day, held on Saturday 3 March 2018 starting at 17:00 pm.